Boscoli was born in Florence where he trained with Santo di Tito who, in turn, had been a student of Bronzino. He was attracted to the Tuscan Mannerists of an earlier generation, notably Pontormo, Rosso Fiorentino and Beccafumi, whose figures he sometimes appropriated and adapted for his own compositions. He visited Rome early on and studied from the antique; later in Pisa he worked on commissions for frescos and altarpieces, but most of his activity took place in Florence between 1582 and 1600, where he produced an abundance of drawings. Clorinda learns the fate of Sophronia and Olindo illustrates an incident from the second canto of Torquato Tasso’s epic poem Gerusalemme Liberata or Jerusalem delivered, first published in a complete edition in Parma in 1581. This work, which recounts a fanciful interpretation of the First Crusade in which Catholic knights battle Muslims in order to capture Jerusalem, enjoyed enormous success throughout Europe. The epic was a popular source of subject matter for painters, and musicians frequently adapted various episodes from it too. 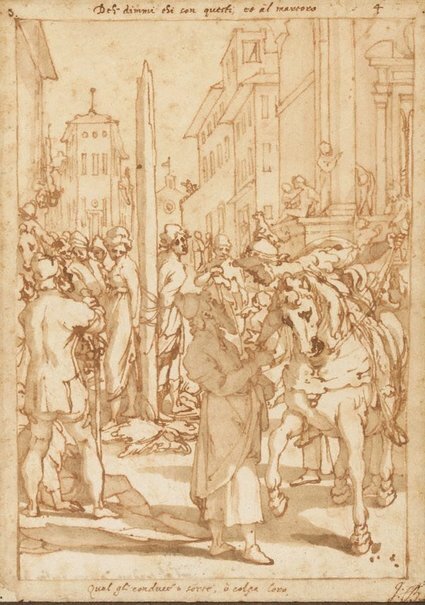 The Gallery’s sheet is a fine example of the busy, highly decorative style of drawing practised by Boscoli, characterised by strong contrasts of light and dark and a rather schematic treatment of the human figure. It belongs to a series of 12 drawings by Boscoli based on Tasso’s epic now scattered throughout various museums and private collections. Within this group there are five drawings – including the present one – which depict scenes inspired by the romantic subplot of Sophronia and Olindo, one of the earliest narratives in the poem. Aladin, the Saracen king of Jerusalem, had stolen an image of the Virgin from a Christian church and set it up in a mosque, having been told by a sorcerer that the Virgin would then forsake the Christian army and favour the Muslims. But when the image is stolen a second time, the enraged king orders the execution of the Christian inhabitants of the city. To save her people, a young Christian woman named Sophronia goes before Aladin and claims that she committed the offence. When her lover Olindo learns that she has been sentenced to death, he rushes to the king and proclaims himself as the real offender. (This scene, which immediately precedes our drawing in the series, is in the Hermitage Museum, St Petersburg.) But instead of freeing Sophronia, the king orders both of them to be burned at the stake. The Gallery’s drawing depicts the young lovers tied to the stake just before the pyre is lit. Clorinda, a pagan female warrior (identified by the tiger emblem on her helmet), enters the scene on horseback and asks an old man in the crowd what is happening. Taking pity on the plight of the lovers, she intervenes and gains their freedom by promising in return her service to the king in his defence of Jerusalem against the Crusaders. The final drawing in the Sophronia and Olindo sequence, now in the Kupferstichkabinett, Berlin, shows the lovers released from the stake and set free. With their high degree of finish and tidy, elegant inscriptions, it would appear that the works were made as presentation drawings for a connoisseur; they might also have been intended as designs for a series of prints, although such a project was never realised. All five drawings illustrating the story of Sophronia and Olindo once belonged to the 18th-century English collector John Barnard, as we can see from his collector’s mark in the bottom margin. Signed l.c., pen and brown ink "Boscoli". Not dated. Peter Raissis, Look , 'Gone but not forgotten', pg.12, Sydney, May 2004, col illus p 12. Prints & drawings Europe 1500-1900 , Sydney, 2014, p 32, col illus p 33. Julian Brooks, Andrea Boscoli’s Loves of Gerusalemme Liberata , 2000, p 453 as missing. Nadia Bastogi, Episodi salienti della fortuna della Gerusalemme liberata nella grafica fiorentina tra Cinque e Seicento’, in Elena Fumagalli, et al, L’arme e gli amori: la poesia di Ariosto, Tasso e Guarini nell’arte fiorentina del Seicento, , Florence, 2001, p 89 as missing.